Meldreth Primary School remained unbeaten as they won the South Cambs SSP ‘Small Schools’ tag rugby competition for the first time. The mixed team of year 4, 5 & 6 pupils scored 26 tries as they won six matches and drew one on their way to victory. A record number of 15 schools and over 180 children took part in the event which was held at Melbourn Village College. 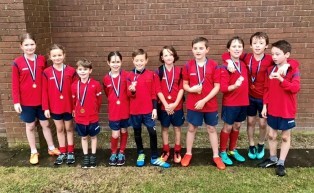 The competition for schools with fewer than 120 pupils in Key Stage 2 was played in a round robin format with teams organised into 2 pools and playing all other teams in their pool. There was some good rugby on display with not much separating the top 3 teams in both pools. Harston & Newton won pool 1 with 5 wins from 6 matches, a 5-2 loss to last year’s runners up Haslingfield their only defeat. Haslingfield dropped points against Elsworth and Great Abington which meant they could only manage 2nd place in the group. In pool 2 last year’s champions Hatton Park did their best to defend their title and played some good rugby but they could only manage a 2nd place finish with losses against newcomers Barrington & overall winners Meldreth. Playing some outstanding rugby it was Meldreth who won the group and claimed the overall title courtesy of an unbeaten display and a better points tally than pool 1 winners Harston & Newton who were pleased to finish as runners up. Both Meldreth & Harston & Newton primary school now go forward to represent South Cambs at the Cambridgeshire and Peterborough Sainsbury’s School Games Spring Finals on 23rd March 2017; we wish them the best of luck! 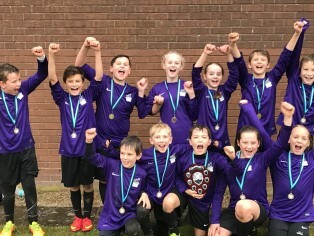 The ‘Spirit of the Games’ award that recognises the team that has shown good sportsmanship and best demonstrated the sporting values of respect, determination, teamwork, honesty, passion and self-belief was awarded to Elsworth Primary School. 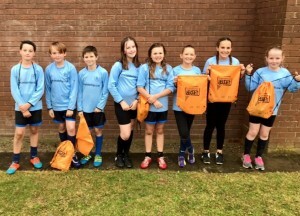 The sports leaders judged them as the winners for showing great determination and passion throughout the afternoon even when results were not going their way. Find out more about the work we have been doing on the Spirit of the Games values here.